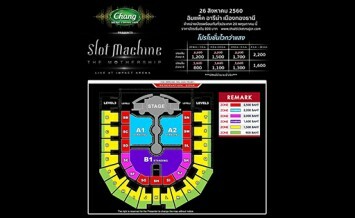 "“Slot Machine – THE MOTHERSHIP Live At Impact Arena”"
Chang Music Connection Presents “Slot Machine – THE MOTHERSHIP Live At Impact Arena” seating plan has been released!!! Check it out before the sale date!!! Tickets go on sale on Saturday 20 May at 10:00am. at all ThaiTicketMajor outlets or at www.thaiticketmajor.com. For more information, please call 0 2262 3838.